The importance of competitiveness has increased rapidly in recent years, where a fresh look at the different forms in which competitiveness manifests is needed. Though the exceptional growth of East Asian economies has been hypothesised previously from a socio-cultural perspective, links have often been vague with little empirical evidence to support them. This book proposes that a unique paradigm of competitiveness has developed in the East as a result of the cultural traditions and social values influenced by Confucianism, and extends this hypothesis by exploring a critical missing link: the role of discipline. Based on data from the Programme for International Student Assessment (PISA) and World Economic Forum (WEF), this book sheds light on important insights, through empirical evidence, that culture and discipline play an important role toward a country’s academic performance, and ultimately, competitiveness. In comparing six geographical clusters, this book analyses data by applying the "Inter-ocular Test" – visualisation of data distributions – to supplement traditional statistical mean comparisons. The findings advance the discourse on culture and performance, by drawing attention to the significant impact that improving discipline can have for a nation’s productivity–not only those of Confucian East Asia. Written with the evolving global economy in mind, this book highlights the relevance of discipline for shaping individual productivity for the future workforce, and offers new perspectives on how this can be achieved for all societies through three key contributions: Taxonomy of Discipline dimensions, "Parent-Engagement-School-Discipline Taxonomy" (PESD), and Wheel of Competitiveness. 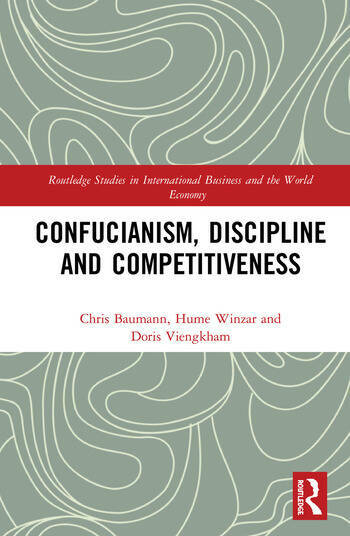 Building on the authors’ prior works, this book offers a comprehensive look at three interrelated concepts: Confucianism, Discipline, and Competitiveness, and how they relate to performance in East Asia. Written in an accessible style, this book will be a valuable guide for students, educators, practitioners, and policy-makers who seek to further understand the valuable role of discipline in shaping the success of societies, present and future. Dr Chris Baumann is an Associate Professor at Macquarie University, Sydney, a Visiting Professor at Seoul National University (SNU) in South Korea, and a Visiting Associate Professor at Osaka University in Japan; formerly also at Aarhus University in Denmark. Dr Hume Winzar is an Associate Professor at Macquarie University, Sydney, and director of the degree in Business Analytics. Doris Viengkham is a doctoral candidate in the Faculty of Business and Economics (FBE) at Macquarie University, Sydney.